The Oppo sibling company has brought the “Realme Yo Days” sale for their customers which can be grabbed from Amazon, Flipkart and realme official website depending on the smartphone offers from the website. The sale has already started from 9th April and will continue till 12th April. The four-days sale brings attractive deal at just Re 1. For the customers who are interested to buy the Realme 2 Pro will get an opportunity to get a limited-period offer to get the Realme Buds for free. Yes, for FREE. 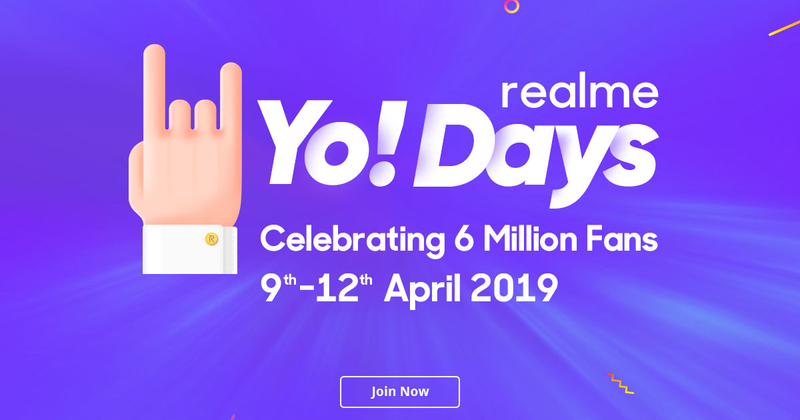 the company said that, it is overwhelmed and is celebrating its happiness of six million users with everyone via the “Realme Yo Days” Sale. The company said that the new Realme 3 can also be grabbed during the four days sale. The Realme announced about the Realme 2 Pro via the official Twitter account and it is also in the banner that during the four days sale, the smartphone will get Rs 1,000 cut down in all the three variants. Along with the cut down price, the smartphone will get an extra discount of Rs 1,000 on prepaid transactions if made via Flipkart. Apart from this, the first 500 lucky customers will also get Bluetooth-enabled Realme Buds if they purchase the Realme 2 Pro at 11AM on 10th April. Also note that, the Rs 1,000 cut down price on the Realme 2 Pro will be permanent i.e. it will now be sold with the price tag lesser that Rs 1,000 from the original price which will be implemented during the sale. The price tag of the Realme Pro before the sale was Rs 12,990 for the 4GB of RAM and 64GB of internal storage variant while the 6GB of RAM and 64GB of onboard storage was carrying a price tag of Rs 14,990. Recently launched Realme U1 will also be discounted during the four days sale. For the 3GB of RAM and 64GB of onboard memory, the Realme U1 will be brought during the open sale which will be held on 10th April at 12PM IST. While on the other hand, the 3GB of RAM and 32GB of storage and 4GB of RAM and 64GB of onboard storage variants of the Realme U1 will get Rs 1,000 discount during the sale on prepaid purchase made via Amazon.in. The original price of the 3GB RAM/ 32GB, 3GB RAM/ 64GB, and 4GB RAM/ 64GB storages is Rs 9,999, Rs 10,999 and Rs 11,999 respectively. The first 500 lucky customers will get free Realme Buds on purchasing the 3GB/64GB storage variant on 10th April at 12PM. Along with all these discounts and sale, the Oppo spin-off has also brought flash sale giving attractive sale of just Re 1 on its Tech Backpack. It will be limited and can be grabbed on 9th April and 11th April at 11:50AM. The Realme 3 has also been made available from 12PM IST on 9th April and joined the four days sale. The new smartphone is on sale via Flipkart and the Realme website. The Realme 3 was launched in March in India with a price tag of Rs 8,999 for the 3GB RAM/ 32GB storage. Few days back, the company announced that it has sold more than five lakh units of the Realme 3 that too within three weeks of the launch.